Alright, based on you reading this blog, we can guess that you like to get high. In fact, what person doesn’t. Most people who say they don’t are just scared to try or haven’t found the right kind of high that works for them. With some exceptions, the whole world likes to get high in one way or another. As it turns out, some animals do too. That’s right, its not just us anymore, we’re not so alone after all. Many different animals can experience the effects of weed, so let’s take a look at which animals can get high and how it affects them. The results are pretty surprising. 1. What Animals Get High? If you know of animals getting high, its probably from dogs. 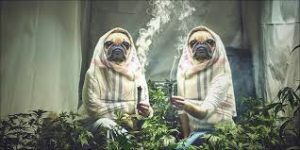 When dogs get high, its similar to when we do. They relax and lie down and generally get in a chiller mood than they usually are. Sometimes they can get a bit confused, so always be careful. You’re less likely to encounter these in the wild, but they do get high. Or more accurately, elephants like to get drunk. They can get drunk and aggressive but they require a large amount of alcohol. If you somehow encounter a drunk elephant, the best idea is to stay out of its way. As we’ll tell you later, this can be very dangerous. Bees also like to get drunk, which seems a little weird, right? Some bees actually become something similar to alcoholics when they consume liquor. When they fly around, they actually get more aggressive and move less. A lot like humans actually. These majestic beauties actually have a strong affinity for the shrooms. Not the type that humans tend to eat to get high, but ones that are actually poisonous to us. But reindeer’s strong stomachs allow them to consume them without serious harm. And when they do, they experience a powerful high that leaves them excited and playful, and keeps them coming back for more. Getting back to the exotic, jaguars actually love to get high as well. After a full day of being totally badass, these guys like a little something to take the edge off just like us. They chew on the root of a plant that starts to give them hallucinations. Of course, being so cool means they do something cool as well. Now, it might be a bit scary to run into a hallucinating jaguar in the wild, so we recommend staying away from these guys. 2. Is It Safe For Animals To Get High? The answer is mostly. Like humans, overdoses of weed don’t pose much of a threat to the animal kingdom, but also like humans, the effects could put them in some bad situations. As people, we don’t have to worry too much about the constant need for survival or the threat of predators. That is something we left behind when god gave us the smartphone. But, animals still rely more on their senses than we do. On the other hand, it isn’t always safe for humans to be around high animals. They begin to lose control of their bodies, and might not necessarily know how to handle being out of their element. For example, in India, an elephant got into a supply of booze. This all sounds funny and good, but instead, it went on a rampage that left 6 people dead. Introducing animals to something that they’re not familiar with and wouldn’t encounter in nature can be disastrous. One rule about animals getting high should be that nothing should be stoned if it can kill or hurt you. Another is that you must always do research about a drug’s affects on animals. It may be safe for you, but not for them. As a general rule, this might be better to just leave alone while you keep getting stoned yourself. It depends on if this is a good idea or not, but we’ll stick to an easier one. Getting a dog high is safe, and can actually be beneficial to them. When getting a dog stoned, the best place to put the smoke is actually in their ear. If you do want to get a dog high, take a hit of weed, and blow the smoke into their ear. Now, be very careful, and only do this once or twice. It has been shown to help them, especially with stomach issues. That being said, please, please, please don’t go crazy with this. Animals don’t have the ability to make choices the way we do. Do not get your dog high all the time just because its fun. Once or twice may be fine, but leave it at that, and always see how they react first. And there you have it, the ultimate guy to stoned animals. They are among us and partying as much as everyone else. So if anyone ever complains that you have lost touch with nature, remind them than animals chill and get stoned all the time. And if they question why your dog is lying down and less jumpy than usual, remember that maybe they needed to relax and cut the edge off. Now this doesn’t mean you should go around getting the whole world stoned. Remember that this can be dangerous for some creatures who need it. We recommend only doing it occasionally to animals that you know and that trust you. That way, you can be safe and they can be chill. Anyway, good luck with your baked animals. Until next time, stay primitive! Doobdasher offers a safe and secure online system to buy mail-order marijuana for residents across Canada. If you’re a first-time smoker, all of our marijuana is conveniently categorized by type and accompanied by easy-to-understand product descriptions, so you know exactly what you’re getting. Shop now and use the coupon code “doob10” to get 10% off your first order!